We’re delighted that our recent Social Mobility Commission report, our first ever collaboration with Education Datalab, received extensive international media coverage. The report explores the relationship between ethnicity, gender and social mobility and how these interact. Coverage began with a front-page splash on the Guardian’s website, followed by Radio 4’s Today Programme (listen here) and a BBC online article. 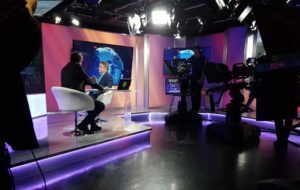 This was followed up by LBC radio who broadcast an extensive interview with our Director, Loic Menzies and the Islam Channel who interviewed lead author Bart Shaw. Coverage soon spread around the world, from The Dhaka Tribune and Al Jazeera and even including a surprise interview with Deputy Director Anna Trethewey on Russia Today. Whilst much of the coverage focused on ethnic inequalities in the workplace, The TES chose to focus on concerns around the impact of setting and streaming in schools. Meanwhile Nursery World explored our findings relating to the early years. Various regional papers also covered local angles. Finally, the Mail Online explored some of our conclusions relating to disparities in university access. In the early years the socio-economic attainment gap is larger for white British and white other groups than other minority ethnic groups. White British and white other children from low income homes are the lowest performing groups at primary school. White British pupils also make the least progress throughout secondary school resulting in a worsening in their performance by key stage four. Disadvantaged young people from white British backgrounds are the least likely to access higher education, with only 1 in 10 of the poorest attending university, compared to 3 in 10 for black Caribbean children, 5 in 10 for Bangladeshi and nearly 7 in 10 amongst lowest income Chinese students. Despite this, ethnic minority groups experience higher unemployment rates compared to white British groups. Black children now enter school with levels of literacy and numeracy that are largely in line with the average child in the UK – 67 and 75 per cent achieving a good level at age 5 in literacy and numeracy respectively, compared to the national average of 69 and 76 per cent. Yet by the end of primary school, black pupils are beginning to fall behind the national average in maths, particularly boys. While 77 per cent of pupils achieve expected levels nationally, for black pupils this is 74 per cent and for black boys, only 73 per cent. Secondary school is where black pupils’ attainment falls behind substantially and by age of 16 black students are the ethnic group least likely to achieve a C in their maths GCSE – only 63 per cent attaining this level, compared to a national average of 68 per cent. For black boys this is worse, at 60 per cent. This translates into strikingly low attainment in science, technology, engineering and maths (STEM) A levels at key stage 5. There has been an increase in educational attainment for Pakistani/Bangladeshi pupils and their performance has improved at a more rapid rate than other ethnic groups in recent years at almost every key stage of education. Almost half of Bangladeshi and over a third of Pakistani young people from the poorest quintile go to university. Despite achieving higher qualifications at school than their male counterparts, researchers find that female Bangladeshi graduates are less likely to gain managerial and professional roles than male Bangladeshi graduates. For maths and english, girls outperform boys throughout primary and secondary school apart from in maths at Key Stage 2, where poorer girls in particular lag behind boys. Females and males now perform similarly in STEM subjects with boys increasing their performance over recent years. However, girls are less likely to take these subjects. At all key stages in maths and english, attainment has increased the most amongst FSM pupils, particularly amongst FSM girls in maths. Schools should seek to involve and work with parents and should particularly target those from the groups that are least likely to engage in their children’s education, such as poor white British and Gypsy, Roma and Traveller (GRT) groups. Schools should avoid setting, particularly at primary level, and government should discourage schools from doing so. 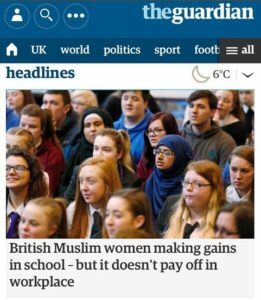 Schools, universities and employers should provide targeted support to ensure Muslim women are able to achieve their career ambitions and progress in the workplace. Universities should implement widening participation initiatives that are tailored to the issues faced by poor white British students and address worrying drop-out and low achievement rates amongst black students.